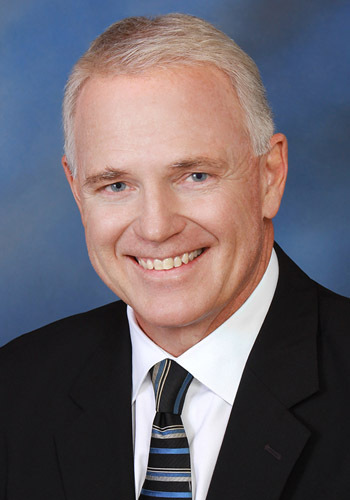 Mr. Burnett was born and raised in Jacksonville, Florida, and graduated from the Bolles School in 1980, later serving as a member of the Bolles Board of Trustees from 2001 to 2007. He attended Tulane University on a football scholarship from 1980 to 1984, and at graduation ceremonies was awarded the Martin Kelly Memorial Award for the player who contributed the most to boosting the team's competitive spirit and made the greatest overall contributions to student life at Tulane, as well as the New Orleans Quarterback Club Scholastic Award for maintaining the highest overall grade point average for a Tulane University football player during his four years there. In 1987 he graduated from Loyola University School of Law in New Orleans and was honored with the BNA Civil Trial Award for academic excellence in his senior year. Since graduation he has spent his entire career in Jacksonville, and has extensive civil litigation and trial experience in multiple counties throughout northeast Florida. Mr. Burnett has for many years held an AV rating from Martindale Hubbell, been recognized as a Top River City Lawyer by Jacksonville Magazine, and been a member of the National Academy of Distinguished Neutrals since its inception. During his practice he has had significant involvement in serving the legal profession, including time on the Florida Bar Code and Rules of Evidence Committee and Chairmanships of the Florida Bar 4th Circuit Grievance Committee and Florida Bar Fee Arbitration Committee. He has also lectured extensively at bar seminars and law schools on a wide variety of subjects, including proposals for settlement, uninsured motorist coverage, products liability, punitive damages, ethical dilemmas, pro se party issues and all facets of mediation. Mr. Burnett is Florida Bar Certified in state and federal court and now devotes his practice exclusively to alternative dispute resolution, having been privileged to mediate in excess of 4,000 civil cases to date. Areas of focus include, but are not limited to, Personal Injury, Insurance, Premises Liability, Property Damage, Medical and Legal Malpractice, Maritime, Railroad, First and Third Party Bad Faith, Commercial, Construction Defect, Employment Discrimination and Homeowner Association issues. Mr. Burnett and his wife, Kelly, reside with their family in Atlantic Beach, Florida. Mr. Lucas has extensive civil trial experience representing both Defendants and Plaintiffs in a broad range of complex cases, including Medical Malpractice, Professional Liability, Nursing Home, Bad Faith and Products Liability. His ability as a civil trial attorney gained National attention in 2002 when he successfully defended the team physician for the Jacksonville Jaguars who was sued by a former player for medical malpractice. Mr. Lucas holds an AV rating from Martindale Hubbell reflecting the highest distinction available for legal ability and adherence to professional ethical standards. For five (5) consecutive years, Mr. Lucas has been recognized by Florida Trend Magazine as one Florida's Legal Elite, which represents Florida's top 1.6% attorneys. Over the past several years, Mr. Lucas has specialized in mediation. He is a State and Federal Court Mediator and has mediated more than 2,000 cases involving multiple areas of civil law including: Appellate, Automobile Negligence, Bad Fath, Breach of Contract, Commercial Disputes, Construction Defects, Erisa Claims, Employment Discrimination, Landlord/tenant, Medical Malpractice, Nursing Home, Premise Liability, Professional Liability and Wrongful Death.